It’s 10:00am. The siren just went off. A dull, high alarm where everyone stops, stands still with heads slightly bowed. There’s a deep resounding silence as the cars stop and everyone gets out onto the road. Young school children stand at the front of their school gates, holding onto the iron fence rails. Mothers with prams, old people on their morning stroll all freeze. It’s an eerie moment which brings home the Holocaust as more than a memory but as a national moment which we all share. This morning as I stood still in my own silence whilst the alarm rang, a modern shofar of calling. Beyond the whine of the siren I hear dogs yapping and the chirping songs of the Jerusalem birds, which is usually drowned out by beeping traffic. It felt so peaceful, and I thought to myself that the dogs go on barking and birds chirping around us, through all moments in our lives. Through the generations. When the Jews were taken to the forests to be shot, piled onto railway carriages, lining up heads shaven, tattooed, a mere number on the way to be gassed, or those marched to their death. All would have heard in the silence yapping dogs and chirping birds. There’s a deep sadness in realising that we humans are our own worst enemies. We cause more death and destruction than any natural disaster that befalls us. Last night we lit the Holocaust memorial candles that my boys brought home from school. 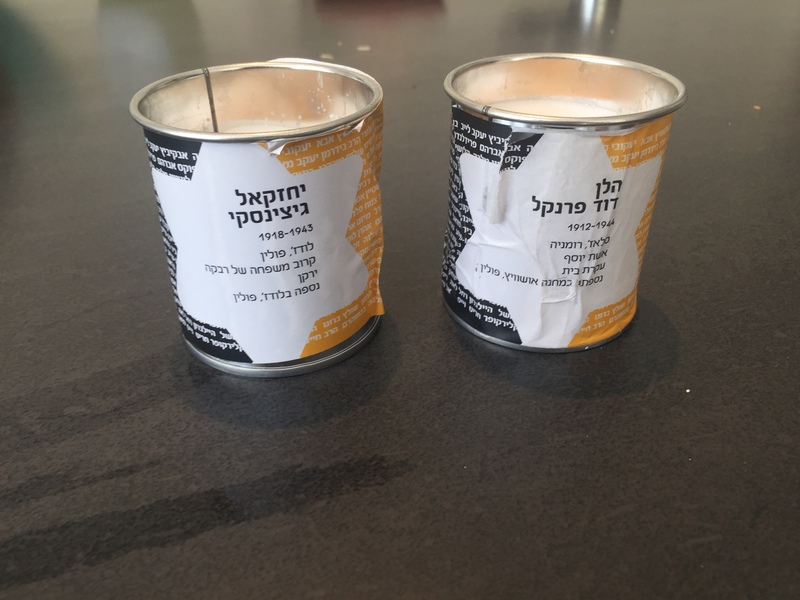 Each candle had the name and details of one of the 6 million murdered Jews. The boys read their names and my thirteen year old as he lit his candle said without prompting, ‘This is in memory of Yechezkal Gitzinski’. And as the memorial candles flickered alive they reflected our lives. One life passes on and another one is born. The whole of European Jewry perishes in a gas oven and an antiquated country and language is renewed, reborn. A phoenix flying high from amongst the tear stained bloody ashes. We can’t forget our past. We’ve moved forward and left the shtetl towns with their ghosts, but the tremors of sadness, loss and fractured spirits are still felt. My mother in law can’t speak about her father’s murdered family from Brno, Czechoslovakia. And the saddest of all are the lonely survivors, who live in abject poverty under our very noses as was discussed on Jerusalem radio yesterday. Where Do All the Tears Go? This is my website which I call my home to share my thoughts, experiences, writing and recipes. To explore what it is to be a woman, a Jew living in Jerusalem, a mother, a fellow human being walking the unknown path, sometimes crooked, straight, shadowed, lit up, always blessed, that we call life. I am really proud and humbled to be awarded second place in the 2018 Anna Davidson Rosenberg Poetry Competition. I love this recipe because it’s a great all in one meal. I got the idea from a friend’s house we went to for a meal. She says she often cooks rice in the oven. Something I had never heard of before. I’ve always cooked rice in a pot. So this was a different concept, an all in one, easy peasy recipe of yummy rice and chicken in a casserole dish, which everyone loves. So I googled a recipe and found this one. I am posting this link here, https://www.recipetineats.com/oven-baked-chicken-and-rice/ so the original is attributed, and it does describe in much greater detail the process, and I’m typing up my version of it here because I never quite stick to instructions. Having said that I don’t recommend straying from the amounts of water, the rice can turn out too soggy or dry – I learned that the hard way. I’ll be honest here I just put whatever I want on the chicken. This is a good guideline though. Cut onion and garlic and scatter them on a casserole dish with olive oil and pop in the oven for 10-15 minutes so they are golden, careful not to burn. Mix chicken with chicken rub – you can also prepare this in advance. I add olive oil as well. It adds flavour and moisture. Add washed rice to the garlic, onion in dish and mix. Place chicken on the rice. Pour chicken broth (if you have) and water around the chicken. (I salt my water because otherwise, I find the rice tasteless. Cover with foil and back for 30 minutes. Remove foil, baste with more olive oil if you want, and bake for further twenty minutes, until liquid is absorbed. Fluff up rice and serve. I find if I stuff up the liquids, and it’s too soggy, I can let it cook a bit more to dry out. If I didn’t add enough liquid I add more and cook a bit longer. So don’t panic. Further, you can add other vegetables when you add the chicken. I’ve added potatoes and sweet potatoes. But you can use your imagination and add Jerusalem artichokes, onions and any other veggie you fancy. @2019 - Sarah Sassoon All Right Reserved.